If it’s one thing that we tell customers over and over again is to always be testing new campaign ideas to see what works well for your store and your business. But how can you tell if your campaign was successful or not? In this broadcast, we will go over different ways to measure the success of your marketing campaigns! All right, we’re live once again at CityGro. I’m here were Channing, our customer service success agent. Welcome back chanting. Thanks. Good to be here. We’re excited. Chanting here where we’re talking today all about campaign success and how to get the most campaign success campaigns are kind of the fundamental process of, of CityGro really well. What we do here, and granted we’re not talking just specifically about Citi group, but just in general if you’re having email and text campaigns, how do we drive, because success. So let’s just start high level right there. What does a successful campaign look like? A successful campaign really kind of depends on, on your industry and all that kind of thing. So what you kind of define as success. But really there’s a couple of things that you have to really look at and one of them is definitely your Roy k stands for return on investment. And so kind of simply put for an Roy is really what, how much money you put into it and how much money you get out of it. Is something that you need to evaluate. But, I think to kind of take a step back even farther, the way you define a successful campaign is you must be tracking your campaign because you can’t really make an Roy, you can’t really be able to see what’s, what’s happening if you’re actually not tracking, if there’s no. If there’s no numbers, there’s no information about who’s using it, you know, all those kinds of things, then it becomes very difficult for you to even begin to understand what’s really going on. Right? So to break down Roy, real simple, if I, if I understand right, is return on investment. If I invest $100 to send out a blast, let’s say, which would be a fairly large blast. You’re either on average what? Twenty $5 per thousand. So let’s say I’m sending out 4,000 black. The return is how much money I make from that hundred dollars. $100 go out, goes out, I bring $200 back. I just doubled my investment Roi. Cool, cool. So, so tell me this, what are different ways to measure success? You mentioned like the redemptions and tracking that and they’d be going into detail on how do we measure the success of the campaign. So one of the, one of the ways that you can measure is, you know, we did talk about redemptions, you know, you can actually have systems in place, CityGro does one and hopefully assist them. You’re using has a place that can keep track of offers, redemptions and those kinds of things so you can be able to see how many people are using it and then you can also give kind of a, an average profit of those interactions with customers as well. And if you don’t have, if you actually don’t have a system that is able to see how many things are being used, you really should even use this to paper and pencil, kind of a last resort, last resort down. Exactly. But you can look at how many people redeem the offers. You can see how much, again, you know, how much money you spent on the marketing efforts of sending out that offer, and how much was gained by it. But those are typically pretty common things that you can easily see quickly that can help you to find those, of break this down. I get it. I get a text message on my phone, he says, come in for a Bogo, buy one, get one free. I come in and I showed a cashier, hey, look what I just got on my phone. I haven’t clicked anything, I haven’t done anything. How does that business? No, break that down, right? Absolutely. So if you have, if you’re using a system like CityGro, you’ll have a kiosk option where people can actually select that off from the kiosk and the system will then keep track of that for you. If you’re not using a system that has that ability, your, you training for your, for your employees needs is paramount. They’re going to have to track on that because they need to track themselves. So they’re either, maybe in your pos, you have something that you set up that is that offer. So you can track it through your pos. But if you don’t, it needs to be marked somewhere. You know, someone came in, we buy one get one free kind of thing and marked somewhere. What we see a lot of, and this is where training becomes critical because what we see a lot of is that scenario where they come and they say, Hey, I got this discount. The employee on the other side a has a few options to add that discount. They could let, let’s say it was a $10 item. They got half off. They could just say $5 item and then charge $5, which is still technically correct for the customer. Or they could say discount is half off or they could actually, like you said, create a button that says for this campaign, use this half off button. The trouble that we see a lot if you’re doing one of the first two methods is it’s really hard to tie back to a certain campaign unless you’re doing it like only within the hours. So you know, everyone that came in with our was from that campaign. You really want to try to tie it back to that campaign that it was sent to. You know, definitely. And the other thing, the other thing too, about the other way is there’s a lot of room for human error when you’re doing the other kind of first two routes. 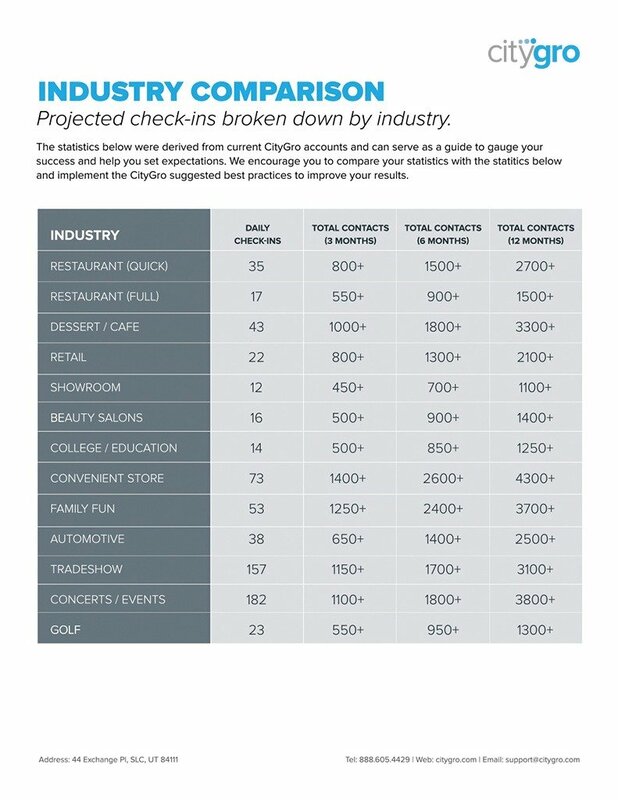 So it really in, in, in reality some of the cleanest, easiest ways for you to be able to track what’s going on with your company, how people are using the offers is to have something set up in your system by either using a POS that has it or using a system like CityGro. They can actually track that for you because it makes it clean, clear, and your employees trained the right way. It’s simple for them to do it. It’s not extra work for them and they can do that and make sure that you’re getting the information you need. And then, like you said, worst case scenario, at least have a, a paper pencil handy that you can mark how many people came down with that promotion specifically. And be careful if you’re, if you’re, if you’re doing like five promotions all at the same time or you got coupons everywhere, maybe you need to have a coupon code that ties it to that campaign or something like that. So as best you can tie to a campaign, we have a system that can track all your system. That’s also an easy, that’s an option. So let’s talk a little bit about what happens if I’m not having a successful campaign. Finally I start tracking it and I realized, man, this isn’t as good as I thought it might have been. Right? So your first reaction is all that, you know, is like, oh, what a waste of money kind of a thing. But really the reality should be is if you feel like you’re not getting the success or you can see that you’re not getting the success, you just need to evaluate some things. First off with the idea in mind that everything is a learning experience. Marketing is all about how you adapt to what you learn. And so the most effective big companies that make money and grow and all those things, they are constantly learning and learning. And so that’s part of this whole thing is there’s, there’s a tuition cost to this knowledge. And so one of the ways that if you see this happening is you need to recognize, OK, so something wasn’t working, let’s try a different approach. So that’s kind of what the first mentality needs to be in this, in this kind of whole process. The other thing to recognize is that, the correct expectation of what success is when, when you’re looking at all this wasn’t successful. For instance, some very large companies, they expect a 10 percent Roy on there for their investments. So what that means is when a company like Coca Cola spends a dollar in their marketing, they expect, or they’re getting a dollar 10 a dollar and ten cents back. So really they got ten cents on the dollar that they spent, which doesn’t seem like a lot until you started spending a lot of dollars. Exactly. I’m percent. And so one of the challenges that we face is, you know, we want to be careful with our spending, we want to be savvy and smart and how much we’re spending and not spend too much. But the realization is that we can’t spend $25 on marketing and expect 100 hundreds of dollars back. That’s just, that’s not actually got a really good camera. Good. Yeah. But it has happened, but it isn’t perspective of, of in marketing dollars, kind of what goes out. Absolutely. And it can be an expectation, you know, that’s how you, that’s how you all that success. No, that’s an awesome campaign. You know, if you got it, that’s great and it, it’s done. People do it. But that shouldn’t be the expectation of all of your. If that is happening, put more money into your advertising that’s happening. Please talk to me. I love learning how people are being success here because that’s, that’s how we learned. We adapt. Well, so, so let me ask you this then. Let’s say I spend $50 on a text campaign and I, I assume I get $15 back. It’s a wash is not a failed campaign. Absolutely not. OK, well, one of the nice things is, I mean, honestly, if you, if you can break even even on an offer while on pr campaign, a, you’ve gained valuable knowledge. In fact, the great thing is, is you can look at it and say, I gained knowledge for free. If you come out, if you come out of Uva, you learned more about your customers, about how people perceive your company and also how you perceive your customers. And so even if you come out even a, you’ve just gained knowledge in essence for free. What I think a lot of people love about text marketing is that ab testing model where if I want to Ab test a billboard isn’t expensive, lab tests, I pay several thousand to get it up there, probably commit for six to 12 months and it’s there. Then icing. And the way I like to really look at it at text marketing is let’s add $100 and I’m willing to test. I could take four sets of a thousand. If I’m paying two and a half cents a message and I can say, OK, I’m going to test this message four times, chances are with text messaging, you at least break even because of a thousand people that go out. All most businesses usually need is a few people come in to make it worth their right. So there is a really good chance that you spend that $25 and you get that [inaudible] back. But, that’s the nice thing. You look at it and make small tweaks. I’m going to try for messages, ABC and D, maybe I have one fail to have a break even in one kill it. But I liked what you said, the cost of tuition. It’s just there is a cost of just learning what works and once you figure it out now instead of doing $25 up to $250 into that for as long as I keep getting the same results. And that’s. And that’s a large part of this whole, this whole challenge about marketing is getting, is getting trust in your method, in the process. And, honestly the great thing is, is as you AB test and practice and you do test to look for results and you start seeing what’s working, you can confidently put more and more a marketing money into that and see more and more returns. And so that’s what it’s all about, honestly, if you’re not constantly evaluating how your campaigns are doing and looking at what’s working, what’s not and changing them, you’re leaving money on the table, right? Because like I said, big companies are successful because they learned to adapt. They start small and then once they find that success point, now they’re taking it and saying, Hey, I worked in text marketing, maybe it’ll work on my email campaigns, maybe it’ll work on my posters, my mailers, and then maybe on that billboard or something like that. Awesome. So, so long story short test, test, test, and see what it comes from. Cool. Well I think we covered a lot of ground here. Is there anything on your mind that you think we covered with regards to success of a campaign? Sure. Well, the one thing I want to say, I guess is when, when you’re evaluating the success of your campaign, whether it was successful or non-successful really, there’s two things. If it’s an offer, a campaign where you’re actually offering your customer something, evaluate two things, does it financially makes sense for you? Is it a savvy business move, you know, to be able to actually afford it, all those kinds of things. And is it an attractive offer for your customers? Because sometimes we give away too much. That happens. We sometimes offer too much and people are using it because it’s a steel and we’re kind of losing money or stuff like that. But more often than not we don’t connect with our customers and make it relevant to them. So it has to be attractive to our customers. And does it make financial sense to me? So you brought up a good point that reminded me of determine the lifetime value of a customer. Right? Which is important to keep in mind because let’s say that you run a campaign and the whole goal is to get new customers in. Maybe you send a message here, you’re texting email list that says, hey, bring someone new that’s never eaten here before and you’ll get buy one, get one free and you determine that, hey, buy one get one free is really like barely breaking even for me, like maybe I’m make a little bit more gen for it in the tr in when considering the lifetime value of that customer. You might have broken even on them the first time, but then you have a customer that’s coming back and back and back and especially if you’ve got them into your data system, it just adds upon itself. Definitely and every, every business owner needs to evaluate what financially makes sense to them. It’s not just a clear cut, oh, I didn’t make, I didn’t make a whole bunch of money on this campaign, or I broke even, or even I lost some. It’s what was the objective of that campaign and what are my metrics for that campaign? And then you track those metrics and those are the things that’ll help you to get there. Because for instance, if you did a buy one, get one free. If you brought a friend in, yeah, maybe that isn’t a super financially great thing for you to give away some types. I mean I’ll give away so much, but at the same time, if you’re tracking the metrics of new customers and you put a value on the new customers that a friend might spend hundreds of dollars over the next. Exactly. That’s a financially that’s a financially savvy decision for you. So everyone, every customer just needs to be aware of kind of what their metrics are, what they want to achieve with their campaigns. And then obviously again, track it because that’s going to tell you if it’s successful or not. Awesome. OK. So I’ve got a question coming in from mark that I want you to speak to. On average, how long should I run a campaign before I know it’s successful or not? Can I run a one day or one month? How long does a fantastic question honestly will want. It depends on the campaign because if you run a one time, you know, a campaign just like a one day off or like, hey, you know, a flash sale kind of a thing like come in this day, you’re going to be able to do this. I mean that’s one type of campaign, but in reality you’re going to see success depending on you look at your campaign of when did you send it, who are you sending it to, and by what time is a reasonable expectation that that offers should have been used or the customer should have returned or whatever it is. Your metric is. Once you got to evaluate that to the side, how long, you know, is a reasonable amount of time to start seeing success from a campaign. A, for instance, if you’re sending out an awareness campaign like, hey, we have some new new ice cream flavors in our, in our, in our store, you’re not going to have a huge upfront change. That’s usually see little growth in that beginning part, but it has out, you know, it can grow later on. Actually, it’s one of those things where you had to have to be aware of what your timelines are of what you expect. So, so would you say that timelines aren’t probably as important as how many people you get to test it on? Because if I do a one day and I sent out today, I can send that to a mass group of people. If I did like a birthday campaign, I have to wait for enough people to have birthdays to know if it matters. Right. I like how you brought that up. W one thing you can test before you, I mean you can test the offers themselves before you run them in campaigns because like a birthday offer for instance. I mean, it’s a pretty easy. Sometimes you’re like, oh, on your birthday, get a free gift, a free bowl of ice cream. That’s usually pretty effective. And most people, you know, straight, flat free kind of thing, but other kinds of offers like a buy one get one free. But I won’t bring a friend in. I mean all those different things. You can run a test and say you want this week and I’m going to test with this many people. Let’s see how many people come in, how many people were brought in, all kinds of things. And there you go. Also now you know you have a viable offer and you can attach that offer in other campaigns that can be more long-term, but you can test it in the short term and then be able to actually see it in the long-term change it. So. So I guess, yeah, I think that answers my next question. I think basically, amount of people doing it is probably bigger than the time ran and that’s different based on time. It did bring up some interesting ideas though. Like I mean there’s so many different ways to test campaigns because we talked about redemptions and want to do the cash register, but you can even test with staff that just come in the email or text. Like if you put a link that says see more here and a link, you can actually track how many people are clicking the links out of the thousand people. And went out to, if no one clicks the link then doesn’t even matter that they didn’t come to the store, they didn’t click the link for more information in the first place or in an email you could, you could maybe put three offers and have deep more details on the bottom of each one and see which one got clicked on the most. So you have an indication of which three. So you kind of have to just think of, OK, what can I track and go wild with with testing? Right. Fair enough. Cool. All right. I, I think that covers most of the points that I wanted to get to. Do you feel unfulfilled in any area of campaign testing? You know, no, I think, I think we’ve talked about a lot of good things and honestly it’s the real, the real story of the whole thing is it’s a learning experience, you know, learn, adapt, and let’s make money. What’s been your favorite campaign that you’ve seen lately? Off the top of your head? Off the top of my head, you know, actually one of my favorite campaigns I’ve seen recently is people have been doing some bounce-back campaign stuff so people when they sign up for the first time, they come in the very first time and then we have a delayed message that goes out the next day and offers them something to come back within a week or two. And, I’ve actually been seeing that I’m working with some of our new customers as we’ve been doing this and people are being a, being able to see that people respond to offers quite rapidly. Like you don’t have to wait months before these people have never been into your company or something like that. But like you can actually test these offers right away, same week, same. Yeah. Yeah, yeah, that’s fine. I always like this time of season with what taxes because we got some really interesting promotions on how to use your tax return and stuff like that. Well thank you so much for chatting. It was fun. I’m going to be glad you got to be here with us. Again, we’re live here. CityGro. We hope to see next time.